I've just designed and built a plat shop that can sell items even when I'm offline, I'm testing out how well this works. Mainly it's putting plat items inside public boxes, behind fee doors. 1 key element I had with the thanks of Madman's advice, is to add in is the use of TV switches. If you buy the items inside the rooms, TURN on the TV to signal you bought the item. So that other players visiting as potential customers, wont try to open fee doors just to find to their sadness the item is already gone! Now, assuming you READ what I just said about responsibly using the TVs. Feel free to visit the shop at /tele platinum. Is this idea troll-proof? This is a pretty good idea. You better watch out for exploits! With input from Madman I already checked out potential avenues for trolling, and I had to redesign things a few times in order for it to work, but as it stands now, I can't find anymore exploits. So I'm waiting to see if any turn up. Well tbh the seller could just put nothing in the box, or a buyer could intentionally or accidentally not switch the TV. I think exchange boxes would be a good way to make this troll-proof. Already suggested exchange boxes on suggestion box. Beta is no troll, so he will leave the item and if u use the fee door and find no item beta will refund. His concerns are legit, after all, other players might build shops using the same design I'm showing now but with no intentions of selling any items to other players. As for keeping myself trusted, I might consider putting a little more organisation into the running of platinum. I want to give other "shop_keepers" ways of working together to maintain the store integrity. 1st - Possibly having a safe in place, so that if some one DOES need a refund after paying at a fee door but getting no item (may ask player to upload screenshot of their inventory to prove it), and if the owner of the fee door is offline, but one of the other shop keepers is around, then they can refund the player. Might even consult some mods on whether they'd help with an idea like this. 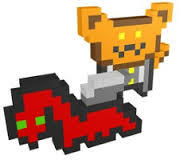 Beta, may I sell m Lawyer Cat, reviewer spawner and a turret? I will add you as citizen, go find any stall thats unused. you need to supply your own sign, feedoor and publicbox. Sadly permanent citizenship is currently revoked. Due to multiple accounts of thiefs stealing item's from other players rooms in the store. I'm currently suspecting it is down to a citizen using his/her home stone to jump into rooms. In the meanwhile, if you wish to trade inside this area, you will have to ask me, or a vice mayor. Bring your own fee doors as usual and if we're missing a box, you'll have to provide your own as well. I only have thieves to blame for this. Until we can fix the integrity of platinum I need to minimize the potential damage players are taking as much as I can. I'm sorry to many of you as I know you well enough to know you wouldn't be responsible for causing this. I'm just acting in impartial 'take no chances' mode. Edit - Oh, and temporarily we are closing platinum to rebuild door setups, we're swapping from TV to chicken (get hurt by kittykat and then eat chicken to get over block on other side of door), that way we'll remove these cases of players NOT using the TV. Any traders whose stuff is still in here, can you please remove it by Monday? I'm friends with all of those mods. Am i trustworthy xD? I think it was adam, freeze, or starman. those are the prime suspects for me. What if you don't get hurt by the kittycat? How is this vote going to go? Is there going to be a separate thread, or is the vote going to be held here? Also, I would like you to take into account the fact that integrity =/= popularity. Anyway, feel free to add me to your polls when it starts!